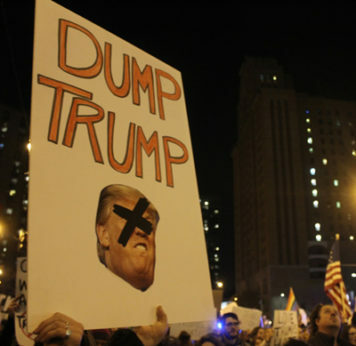 CHICAGO — Thousands gathered in protest outside of the Trump Towers on Wednesday, November 9th, as demonstrators rallied in the wake of Trump’s electoral victory over Democratic frontrunner Hillary Clinton. In her concession speech, Clinton attempted to ease the tension by saying “Donald Trump is going to be our president. We owe him an open mind and a chance to lead.” Not all were in agreement with that sentiment, however, as the country mobilized against the right-wing demagogue in various demonstrations throughout major cities, including Philadelphia, Boston, New York, Austin, TX, Phoenix, and Seattle. While Trump won electorally, NPR noted that Clinton surpassed him in the popular vote, gaining 59,626,052 votes nationally, as opposed to to Trump’s 59,427,652. Though many votes are still to be counted, these numbers are reminiscent of previous elections where nominees failed to acquire the White House through popular vote, leading many to question whether the existing system of electoral politics is truly reflective of the country’s demands. The Chicago rally began at the Trump International Hotel and Tower, off Wacker Drive. A separate group of anti-Trump demonstrators marched west on State street and joined the protestors in front of the hotel. The two groups merged and made their way around the loop area and towards Lake Shore Drive. Chants of “Dump Trump” and “Black Lives Matter” filled the air, while people locked arms in solidarity and walked together through busy intersections. 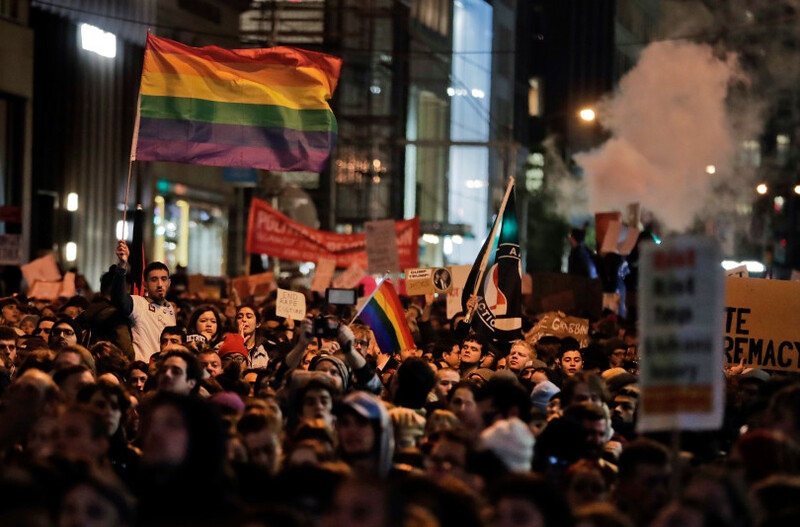 Many attempted to deal with the unexpected results of the 2016 election by exercising their first amendment rights to freedom of assembly and expression. One Chicagoan said that she felt distraught and helpless after the results of the Presidential race, “I was depressed, confused, and overwhelmed. 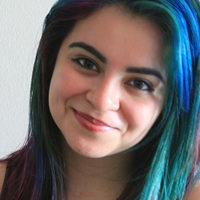 I knew I had to do something other than sit at home and argue with Trump supporters on social media,” said 23-year-old Raeghn Draper, who said she moved to the city from Milwaukee. 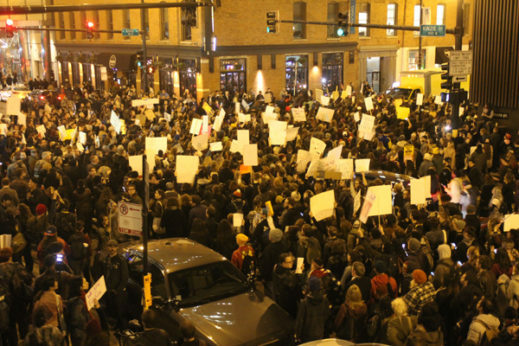 The march extended out across multiple city blocks; nearly all of the protesters remained peaceful. For many outraged voters the real challenges have just barely begun, as activists are hoping to mobilize for more tangible solutions. With a majority of the House and Senate continuing under GOP control, and a Republican President-elect on the way, voters have a long journey ahead in challenging the agenda of a conservative-dominated congress.